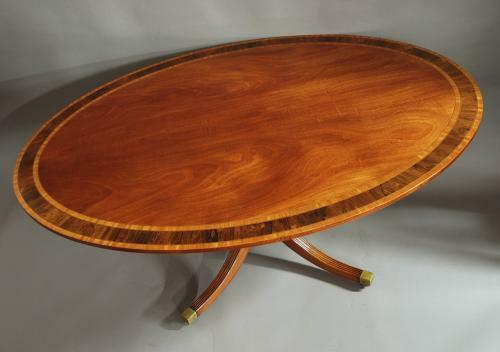 This table consists of a fine quality mirrored mahogany veneered top with various bandings as follows:boxwood & ebony stringing, satinwood cross banding, boxwood & ebony stringing, a wide rosewood banding, boxwood & ebony stringing with an outer satinwood banding. The table is supported by a four splay base with brass box castors. The table could easily seat six and possibly eight, it is in very good condition and can go straight into a home.